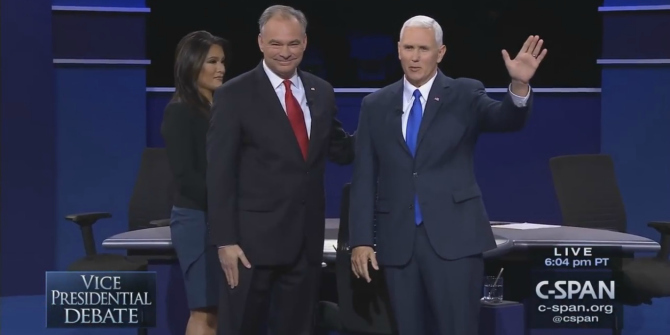 This debate was in some ways a shame for the commentator who permitted again over talking of the VP candidates especially Pence, and she largely did not question lies and false assertions. The greatest fault of the media has been lack of focus before and after these debates on the substance and meaning of the policies that have a real impact on people’s lives and security. The post debate commentary was strictly the “horse race” rather than on what the policies and statements will mean for the future of our nation. It was a sad example of the lack of honest oversight by the media. The good part of this debate is that they did cover international issues. The bad part is they left out climate change, global inequality, and other issues. The really bad was the absence of truth and lack of deep analysis of cost, risks and benefits of proposed policies. The quotes however provide some insight on how each party and the candidates themselves view the role of America in the world, how exactly they see that world, and finally how they would act if they got in power. The VP debate, while not the main event, still indicates the direction each party would take if they won in November. It seems clear that like the first debate between Clinton and Trump their divide on realistic assessment, means of solving or not solving problems and challenges is as wide as ever. It also reveals from this perspective how little the Republican candidates know or really understand how to act in the complex, often dangerous and fast moving world we live in. Clearly once again on the topic of nuclear weapons and associated issues like North Korea and the placement of such weapons in our strategic plans, Gov. Pence seems deeply in the dark. This despite having served on the Senate Foreign Relations Committee. He had a hard time defending past irresponsible quotes on this issue from Trump. The key issue here is which set of candidates will act in the most careful and responsible way and this debate did not change the view that we have in the GOP team — very dangerous people with little understanding of key security issues. Pence: “Donald Trump has made a plan to end illegal immigration once and for all in this country. We have been talking it to death for 20 years. Hillary Clinton wants to continue the policy of open borders, amnesty, catch and release, sanctuary cities, all of the things driving wages down in this country, senator, and also too often, with criminal aliens in the country, it is bringing heartbreak. It begins with border security. After we secure the border, not only build a wall, but beneath the ground and in the air, we do internal enforcement. The focus has to be on criminal aliens. We just had a conversation about law enforcement, a conversation about the violence that is the setting our cities. The reality is, there is heartbreaking tragedy that has struck American families because people who came into this country illegally are now involved in criminal and reprise and activity, and we do not have the resources or the will to deport them systematically. While Pence had a hard time defending the indefeasible lies and policies of Trump he stood clearly on the side of building the “Wall” which would be as an act of total madness and hurt our relations with every Latin American government let alone many of our citizens and undocumented residents. Senator Kaine gave the right answers about how impossible the Trump stance was and how self-defeating. Pence: “It really does begin with us reforming our immigration system and putting the interest, particularly in the safety and security of the American people, first. Donald Trump wants extreme vetting for people coming in. Donald Trump and I are committed to suspending the Syrian refugee program and programs in immigration around the world that have been compromised by terrorism. Hillary Clinton wants to increase it. If you’re going to be critical of me, that is fair game. After two Syrian refugees were involved in the attack in Paris that is called “Paris’ 9/11,” you bet I suspended that program. I stand by that decision. If I am vice president, we’re going to put the safety of the American people first. Pence stuck to the Republican platform that opposes admitting refugees from Syria. By echoing Trump’s call for ‘extreme vetting,’ the Governor of Indiana demonstrated a shared ignorance in the robust vetting process already in place. Refugees are screened over a period of two years before they’re admitted into the United States. Kaine used the topic as an opportunity to highlight this week’s court ruling against Pence’s proposal to block refugees settling in his home state of Indiana. Overall, this topic is a choice between base fear, a lack of understanding of current refugee vetting, and xenophobia or accepting our share of the burden in assisting the world’s most helpless victims. Pence: “Other goal was always that we would only lift the sanctions if Iran terminally renounced their nuclear ambitions. They have not done so. And when the deal’s period runs out, there is no limitation on weapons. $1.7 billion was used in a ransom payment. Iraq has been overrun by ISIS. They failed to negotiate. Hillary Clinton has failed to renegotiate the status of forces agreement. Kaine: “Let me come back to talk about — he does not want to acknowledge that we stopped the Iranian nuclear weapons program. He does not want to acknowledge that Taylor was part of the team that got Osama bin Laden… She worked a tough negotiation with nations around the world to eliminate the Iranian nuclear weapons program without firing a shot. Here is her plan to defeat ISIL. They have to take out their leaders on the battlefield. She will lead the team that will get the head of ISIS. We have got to disrupt the financing networks. On these issues Pence was either badly informed or downright lied, following the tradition of his leader. Sen. Kaine corrected these mistruths. But a campaign based on security issues and especially the Iran one on nuclear issues provided such prevarications beyond acceptable. Most well-read people know that it was President Bush who decided to take our troops out when he could not get immunity for our troops. Here Kaine held clearly the edge and noted the many weakness of Trump’s and Pence’s understanding and indeed especially of Trump’s admiration for Putin. He weakly defended that position at the same time Putin’s forces were bombing and killing hundreds of innocent civilian including woman and children and hospitals in Syria. This was also not addressed or noted by our clueless moderator. Pence had no decent ground on this issue. Kaine seemed to repeat the argument that are going on within the administration but sadly few on any side have any easy answers. We welcome your comments which can be posted here. Visit our regularly up-dated Race to the White House section covering quotes, foreign affairs statements and policies of the presidential campaign candidates and parties. Previous Article VOICES BEYOND OUR BORDERS: WHAT DOES THE WORLD THINK OF OUR PRESIDENTIAL CAMPAIGN? Next Article PRESIDENTIAL SECOND DEBATE: RISING BEYOND THE SORDID AND INTO SUBSTANCE? Want to Stay Informed about Foreign Policy? Stay Connected to the World by Subscribing to RNS! GOP HILL AND TRUMP ORCHESTRATED “OBSTRUCTION OF JUSTICE” IN RUSSIAN PROBE? END OF YEAR ASSESSMENT OF 2017 AND RISKS IN 2018: Calamity or Peace, Stupidity or wisdom? CONCERN AT HOME & ABROAD THAT AMERICA HAS LOST IT WAY & VALUES. TRUMP’S ASTONISHING NATIONAL SECURITY RANT: AN EMBARRASSMENT BEYOND BELIEF. DONALD TRUMP ONCE MORE PROVES HE IS A TOTAL DISASTER FOR OUR NATION. President Obama in an interview late Monday stressed the importance of daily intelligence briefings after President-elect Donald Trump pushed back against criticism that he receives the briefings only once a week.